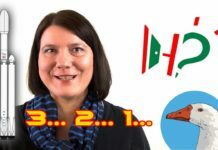 Hungarian language lesson: How to introduce yourself | How to learn Hungarian? Sziasztok! Réka vagyok! Hi everyone! My name’s Réka. 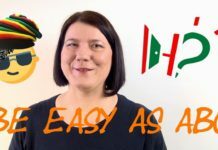 Welcome to howtolearnhungarian.com’s video channel, the place to be if you want more, if you really want to learn Hungarian. In this lesson you will learn how to introduce yourself in Hungarian. Készen álltok? Are you ready? Akkor kezdjük el! Then let’s start! Unlike English, the Hungarian language distinguishes between the formal and informal way of speaking. Every time you open your mouth you have to decide whether you want to speak in a formal or in an informal way. Introducing yourself is no different, so let’s start with the informal style. If you meet only one person, in an informal situation, you say: Szia! Réka vagyok! Meaning Hi, my name’s Réka. You should use your name instead of Réka, of course. The other person says: Szia! Petra vagyok, meaning Hi, my name’s Petra. After the introduction, you may say nice to meet you: Örülök, hogy megismerhettelek. In literal translation this means: I’m glad that I could meet you. It’s up to you if you want to say this or not, many Hungarians don’t say nice to meet you at all, so don’t get offended if you don’t hear it from the person you just met. You may shorten this nice-to-meet-you expression, and just say: Örülök, or örvendek. Both of these mean I’m glad, örvendek is the older version of örülök. If you meet more people, you have to use the plural form for saying hello: sziasztok. So, your introduction will sound like this: Sziasztok! Réka vagyok! Meaning Hello everybody, I’m Réka. You can also say: Örülök, hogy megismerhetlek benneteket! This means nice to meet you all, in literal translation I’m glad that I could meet you all. After the introduction men usually shake hands, sometimes women do this, too. It also happens a lot that women kiss each-other on the cheeks, especially if the introduction happened in a familial environment. Jó napot kívánok! Varga Réka vagyok! Good day! My name is Réka Varga! 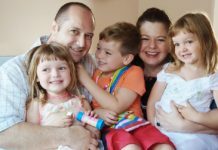 If you haven’t noticed yet, let me tell you that Hungarian family names and given names come in different order than in English. In Hungarian people always say the family name first and the given name second, so in Hungarian my name sounds like this: Varga Réka, where Réka is my given name. When I speak in English I change the order so that people would know that Réka is my given name and Varga is my surname. So, after the other person introduces himself too (for example: Jó napot kívánok, Szabó János vagyok. ), you can say Örvendek, hogy megismerhettem, meaning nice to meet you, in literal translation: I am glad that I could meet you. The verb megismerhettem is in formal speech, so it implies respect to the other person. If you meet several people, the introduction part will be the same: Jó napot kívánok! Varga Réka vagyok!, but the nice to meet you part changes to: Örvendek, hogy megismerhettem Önöket! Meaning I’m glad that I could meet you all. Önök means You in formal speech. Now you know how to greet someone in Hungarian. Try and practice with me. Introduce yourself in an informal way to me. I’ll start: Szia! Réka vagyok! Now it’s your turn!…………. Örülök, hogy megismerhettelek. Well done! So, this is the end of this lesson, in the following one we will learn about numbers. Egy meggymag meg még egy meggymag az két meggymag. It means that a sour cherry seed plus another sour cherry seed equals two sour cherry seeds. So, repeat: Egy meggy-mag, meg még egy meggy-mag az két meggy-mag, and now faster: Egy meggymag meg még egy meggymag az két meggymag. Egy meggymag meg még egy meggymag az két meggymag. If you liked this post, please, hit the like button, and share it with your friends, so they could learn from it, too. Thank you!